Dr. Dong is a transportation engineer at the Center for Transportation Research and Education. 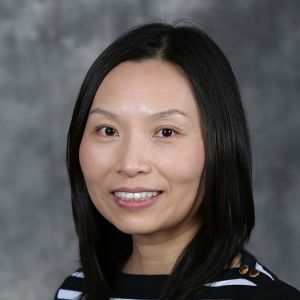 Before joining Iowa State University, she worked at the U.S. Department of Energy’s Oak Ridge National Laboratory as a research staff member from 2010 to 2012. From 2009 to 2010, she was a postdoctoral researcher at the Northwestern University Transportation Center. Lu, C. and J. Dong. 2017. Estimating Freeway Travel Time and Its Reliability Using Radar Sensor Data. Forthcoming in Transportmetrica B: Transport Dynamics. Yang, J., J. Dong, and L. Hu. 2017. A Data-Driven Optimization-Based Approach for Siting and Sizing of Electric Taxi Charging Stations. Transportation Research, Part C. Vol. 77, pp. 462–477. Yang, J., J. Dong, Z. Lin and L. Hu. 2016. Predicting Market Potential and Environmental Benefits of Deploying Electric Taxis in Nanjing, China. Transportation Research, Part D. Vol. 49, pp. 68-81. Hamdar, S. H., A. Talebpour, and J. Dong. 2015. Travel Time Reliability Versus Safety: A Stochastic Hazard-Based Modeling Approach. IEEE Transactions on Intelligent Transportation Systems. Vol. 16, No. 1, pp. 264–273. Dong, J., C. Liu, and Z. Lin. 2014. Charging Infrastructure Planning for Promoting Battery Electric Vehicles: An Activity-Based Approach Using Multiday Travel Data. Transportation Research Part C. Vol. 38, pp. 44–55. Wu, X., J. Dong, and Z. Lin. 2014. Cost Analysis of Plug-in Hybrid Electric Vehicles Using GPS-based Longitudinal Travel Data. Energy Policy. Vol. 68, pp. 206–217. Dong, J. and H. S. Mahmassani. 2013. Improving Network Traffic Flow Reliability Through Dynamic Anticipatory Tolls. Transportmetrica B: Transport Dynamics. Vol. 1, No. 3, pp. 226–236. Lin, Z., J. Dong, and D. L. Greene. 2013. Hydrogen Vehicles: Impacts of DOE Technical Targets on Market Acceptance and Societal Benefits. International Journal of Hydrogen Energy. Vol. 38, No. 19, pp. 7973–7985. Dong, J. and H.S. Mahmassani. 2012. Stochastic Modeling of Traffic Flow Breakdown Phenomenon: Application to Predicting Travel Time Reliability. IEEE Transactions on Intelligent Transportation Systems. Vol. 13, No. 4, pp. 1803–1809. Dong, J., H. S. Mahmassani, S. Erdogan, and C. C. Lu. 2011. State-Dependent Pricing for Real-Time Freeway Management: Anticipatory versus Reactive Strategies. Transportation Research Part C. Vol. 19, No. 4, pp. 644–657. Dong, J. and H. S. Mahmassani. 2009. Flow Breakdown and Travel Time Reliability. Transportation Research Record: Journal of the Transportation Research Board. Vol. 2124, pp. 203–212. Dong, J. and L. Hu. 2017. Macroscopic Traffic Flow Characteristics and Individual Vehicle Fuel Consumption. Midwest Transportation Center, Institute for Transportation, Iowa State University, Ames, IA. Zu, Y., C. Liu, R. Dai, A. Sharma, and J. Dong. 2017. Distributed Traffic Control for Reduced Fuel Consumption and Travel Time in Transportation Networks. Midwest Transportation Center, Institute for Transportation, Iowa State University, Ames, IA. Dong, J. and L. Zhang. 2017. Optimal Placement of Iowa DOT Maintenance Garages: Muscatine and Dubuque Case Studies. Iowa Department of Transportation Report, Des Moines, IA. Dong, J., C. Lu, C. Liu, and N. Hawkins. 2016. Assessing Segment- and Corridor-Based Travel-Time Reliability on Urban Freeways. Midwest Transportation Center, Institute for Transportation, Iowa State University, Ames, IA. Dong, J., M. Makaiwi, N. Shafieirad, and Y. Huang. 2015. Modeling Multi-Modal Freight Transportation Network Performance Under Disruptions. Mid-America Transportation Center, Iowa State University, Institute for Transportation, Iowa State University, Ames, IA. Dai, R., J. Dong, and A. Sharma. 2015. Distributed Traffic Control for Reduced Fuel Consumption and Travel Time in Transportation Networks. Proceedings of the European Control Conference, Linz, Austria, July 15–17. Houchin, A., J. Dong, N. Hawkins, and S. Knickerbocker. 2015. Measurement and Analysis of Heterogenous Vehicle Following Behavior On Urban Freeways: Time Headways and Standstill Distances. Proceedings of the18th International IEEE Conference on Intelligent Transportation Systems (ITSC), September 15-18. Dong, J. and C. Lu. 2015. Assessing Corridor-Level Travel Time Reliability on Urban Freeways. Proceedings of the 6th International Symposium on Transportation Network Reliability (INSTR), Nara, Japan, August 2-3. Dong, J., C. Albrecht, P. Johnson, and M. Makaiwi. 2014. Study of the Regulatory Issues Affecting Truck Freight Movement in the Midwest. Mid-America Transportation Center and Iowa DOT Report, Institute for Transportation, Iowa State University, Ames, IA. Local Committee Member, the 22nd International Symposium on Transportation and Traffic Theory (ISTTT22), Chicago, July 2017.